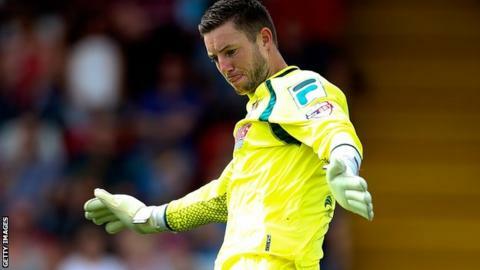 Cambridge manager Richard Money hopes injury will not stop new signing Sam Beasant establishing himself as their first-choice goalkeeper. Beasant, 27, is nursing a sore groin, but with fellow keeper Chris Dunn out with an Achilles problem, Money is worried about him facing a lay-off. Former Hull keeper Matt Duke, 38, played as a triallist in the friendly against Ipswich on Tuesday. He said: "We really want to give Sam an opportunity to cement the position." Beasant has had more game-time than Money originally intended as back-up to Dunn, including a 120-minute friendly against Norwich last Friday, because of the latter's injury. "Sam came in three weeks ago, spent the first week in bed with a real bad bout of sickness, came with us on the bus to Lowestoft and played 20 minutes without training," the U's boss told BBC Radio Cambridgeshire:. "He (then) had a couple of days training, but with Chris's injury we've had to ask him to play 120 minutes last Friday. "His groin was very sore as you'd expect, so the last thing we wanted to do was play him (against Ipswich) - he pulls his groin, and then we really are looking around (for another keeper). "Matt Duke kindly volunteered to come and play for us to help us out of a spot. He's aware we're looking for another goalkeeper, but as I've said we're not going to rush into it. We really want to give Sam an opportunity to cement the position." Money said the results of a scan on Dunn's injured ankle were expected on Wednesday. "The best we can do is hope it's not totally torn," he added.